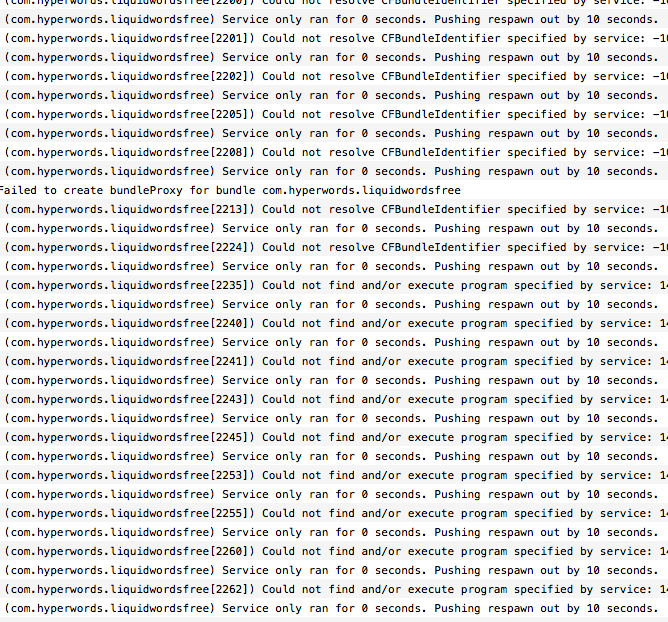 com.apple.xpc.launchd: (com.hyperwords.liquidwordsfree) Service only ran for 0 seconds. Pushing respawn out by 10 seconds. (that last bit may be different for you). If you have trouble finding these folders the nifty PopClip app can, once you have selected the text, offer you a folder icon that will take you straight to the desired location. Alternatively the nifty Hazel app will find all those extraneous files, when you have moved the main app to the Trash, and ask if you want to delete those too. Once it is all cleared out a fresh install from the App Store and all is well again. Today’s secret word is Nifty. Who does not love a good computer operating system? I know I do – every day. As the classic Mac OS grew in to an ever growing tangle of code it was decided to find a replacement and start again. Several options were available and a likely contender was the Be system but ultimately Apple decided to buy NeXTSTEP which had been created by NeXT the company that Steve Jobs had started after leaving Apple – effectively bring Jobs back to Apple. NeXTSTEP was reworked in to a new version of Mac OS. As it would be the tenth version, was based on a UNIX system and was a departure from the last version Mac OS 9 it was called Mac OS X rather but still pronounced 10. The name was later shortened to just OS X. It is now expected to revert back to Mac OS so as to fit in with iOS, tvOS and watchOS. Who does not love messing about building software synthesisers? I know I do and a basic component for these are oscillators. Oscillators are used in all manner of things but it is the wobbly wobbly oscillations that can be used to produce a sound that are of most interest. Such things have been around since the late 1800s but today one can recreate their functions with computer software. Here is a simple example I made using the excellent Audulus app.